In organic chemistry, sometimes you need to build molecules up. Other times, you need to break molecules down. Ozone, which we talked about earlier, is a really useful reagent for that. Here’s another one, although it’s a little more obscure : Sodium periodate (NaIO4) breaks apart 1,2-diols (vicinal diols) to form aldehydes and ketones. In this respect it’s the same as periodic acid (HIO4) and lead tetra-acetate [Pb(OAc)4]. Notice what’s happening to NaIO4 here – it’s becoming reduced from iodine(VII) to iodine(V). In the process we’re cleaving a C-C bond and forming two C-O π bonds. Comes in handy sometimes, when you want to break apart an alkene and form aldehydes and ketones. NaIO4 works by forming bonds with alcohols to the iodine. In the second step, what happens is a kind of reverse cycloaddition (similar to what happens when an ozonide breaks down). 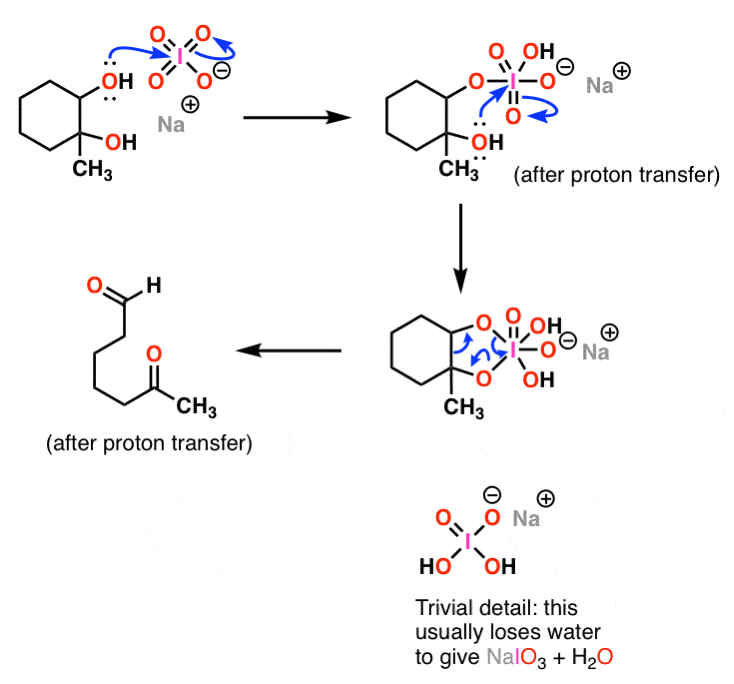 This is a somewhat simplified version of the mechanism (skipping over the proton transfer). The key part here is the third diagram, where the cyclic iodate ester breaks down to give the ketone and aldehyde. And there you go: aldehydes or ketones, depending on whether you’re breaking down secondary or tertiary alcohols (primary alcohols become formaldehyde). So this actually gives you a second way to cleave double bonds to alkenes/ketones besides ozone. You can take an alkene, treat it with osmium tetroxide (OsO4) first to make the diol, and then NaIO4 it. This is, incidentally, sometimes called “Johnson-Lemieux cleavage“. Obscure organic chemistry named reaction of the day! P.S. You can read about the chemistry of NaIO4 and more than 80 other reagents in undergraduate organic chemistry in the “Organic Chemistry Reagent Guide”, available here as a downloadable PDF. The Reagents App is also available for iPhone, click on the icon below! Just throwin’ this out there but have you considered Reagent Friday tshirts?? The reagent on the front w/ the mechanism on the back, or vice versa, or however you wanna do it- have a feeling they would sell. I mean how could a good organic chemist not look forward to wearing their Reagent Friday tshirt every Friday? Or maybe a student could wear it every day and cheat on quizzes with mechanism problems by looking on the front of their shirt; heh, heh, heh. Not like I would do that. In the mechanism, one of the oxygens (double) bonded to iodine is missing in the 2nd and 3rd structure, I think. Otherwise, truly great work. Fixed. Thanks for the spot! Wow! These reagent Fridays are so fun that I’m doing them on a Wednesday! Why doesn’t OsO4, which has a very similar structure to IO4-, also cleave diols? Alternately, why can’t IO4- be used to directly form glycols from alkenes, which are then cleaved subsequently by it? Its structure is so similar to OsO4, why doesn’t it form the glycol in the first step as well? 2(CH3)C=CH-C.3(CH3) ——— ( NaIO4/KMnO4 ) —-> Products? What I thought was that first glycols would be formed by the presence of KMnO4 and then due to NaIO4 as you explained they would converted to aldehydes. But I checked the answer and one of the products was aldehyde but other was carboxylic acid. Can you please explain why and what happens in this reaction. Thank you. The answer was: Acetone + 3(CH3)C-COOH . This is dihydroxylation followed by oxidative cleavage. KMnO4 is responsible for oxidation of the aldehyde to a carboxylic acid. The other product is a ketone. That is really a great explaination sir. But is it only possible in the case of vicinal diols? What if more than more than two OH- groups are present side be side? What if there is =O group in between two OH groups? Sodium periodate can also cleave alpha hydroxy ketones.